THIS INSPIRATIONAL VIDEO IS DEDICATED TO ALL THE AMPUTEES THAT ARE A PART OF THE PROSTHETICS IN MOTION FAMILY! Welcome to the Prosthetics in Motion website! Our New York City Prosthetic Facility will provide you with the highest quality of prosthetic care. We offer our patients the most comprehensive services, combining current prosthetic techniques. Our gorgeous new mid-town Manhattan prosthetic facility is equipped with a spacious gait area, parallel bars, stairs, ramp and treadmill for the ultimate gait training experience. Our fully equipped on-site lab allows us to control and perfect all design aspects of a prosthesis. Prosthetics in Motion is committed to provide personalized, effective care so that you can return to your active lifestyle. We use the latest in technological advances coupled with a comfortably fitting socket to provide you with the best possible prosthetic. Our staff specializes in the Otto Bock X3 Microprocessor Knee, Otto Bock Genium Prosthetic Knee, The Michelangelo Hand, Bebionic Hand, C-leg, i-Limb, flex foot, cosmetic silicone skins and custom prosthetics! 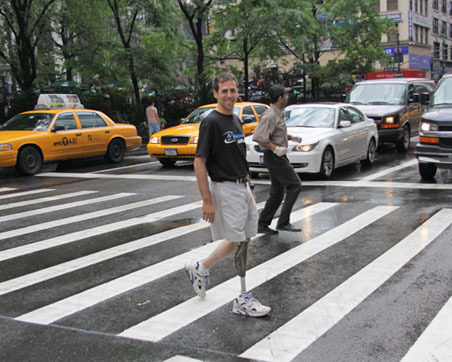 Chris Kort, CPO is the president of Prosthetics in Motion, New York City. Chris entered the field of prosthetics to make a difference and to help people improve the quality of their lives. He is a perceptive, compassionate, talented prosthetist, with 23 years experience and is considered an expert in the field. Chris has helped amputees in a vast array of areas such lower limb prostheses including; below the knee prostheses, above the knee prostheses, knee disarticulation, symes, partial foot, hip disarticulation, bi-laterals, van ness rotationplasty, proximal femoral focal deficiency as well as upper limb prostheses including - body powered and myoelectric. Chris also specializes in pediatric prostheses, sports & specialty prostheses as well as cosmetic prostheses. Chris offers the highest standard of care through his attention to detail, ability to listen and hear your concerns, skills acquired through his many years of experience, and solid educational background. Amputees seeking prosthetic treatment at our New York City location are assured of receiving the best prosthetic care, because of our company's genuine concern for your well-being. RUNS ON THE WEST SIDE HIGHWAY OF NEW YORK CITY! INSPIRING! Prosthetics in Motion has EXPANDED! Our NEW FLOOR is dedicated for patient care! Sean demonstrates the functionality of his low profile custom designed below the elbow prosthesis with the innovative tuff wear humeral cuff. Prosthetics in Motion provides custom life-like silicone skins for prosthetic legs, arms, feet and fingers. These prosthetic silicone skins are functional, detailed and natural in appearance. Fully customized life-like silicone skins will be created to match your own anatomy including hair, veins, tattoos, freckles and the color will be made to match your natural skin perfectly! A 13 year old Bilateral Knee Disarticulation Amputee, who couldn’t be happier Running Like the Wind!! Prosthetics in Motion Designed his Custom Running Prosthetic Legs. NEVER GIVE UP HOPE, ANYTHING IS POSSIBLE! PROSTHETICS IN MOTION is here to support you in reaching your HIGHEST GOALS! 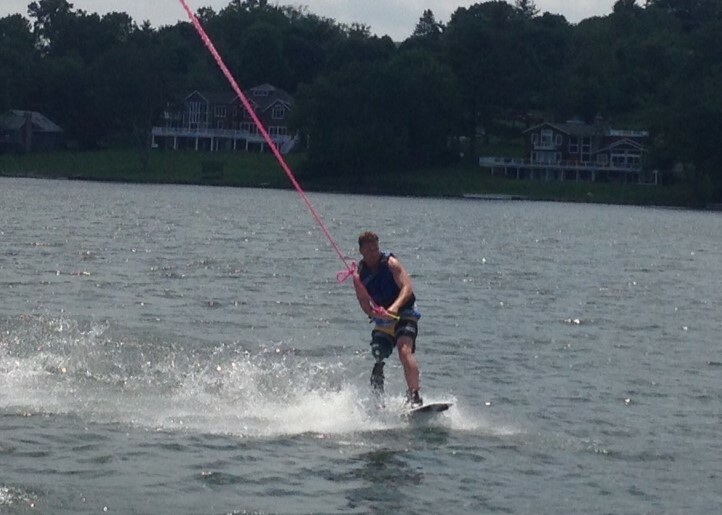 James’ custom designed wake boarding prosthesis utilizes a Moto Knee and Versa Foot from Biodapt. 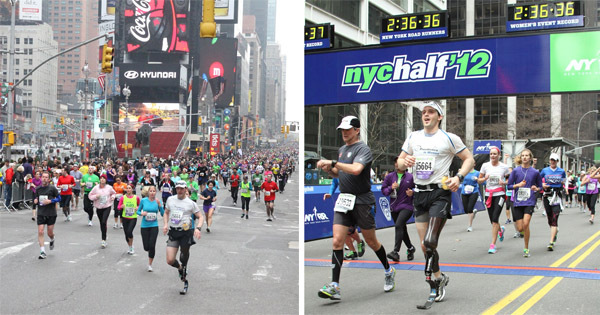 Congratulations to James for fearlessly running on the streets of Manhattan in his specialized above the knee running prosthesis. How does the double-walled vacuum system works? Watch this video and learn how! Pete is wearing an Otto Bock Genium Bionic Prosthetic Knee. personal best time of 2 hours and 12 minutes. 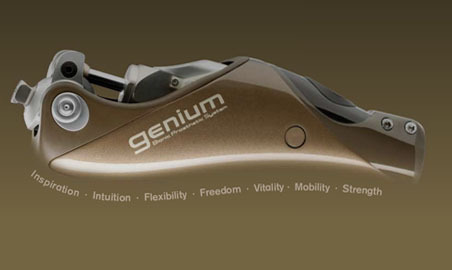 THE GENIUM.....AVAILABLE AT PROSTHETICS IN MOTION! PROSTHETICS IN MOTION IS THE FIRST PRIVATE PROSTHETICS FACILITY IN NEW YORK CITY TO FIT THE OTTO BOCK GENIUM BIONIC PROSTHETIC KNEE SYSTEM! The Genium Bionic Prosthetic System is a new technology platform that is the closest to natural function currently available. This microprocessor controlled knee can anticipate your movements and adapt instantaneously in order to function as close to a natural leg as possible. Changing direction, shifting speeds, ascending stairs, walking backwards – the user can more easily and more intuitively move through the activites of daily life. Practical design features, like 5-day battery life, an additional mode, water resistance, weight limit of 330 lbs. and additional functionality, such as the ability to smoothly step over obstacles makes this the most advanced prosthetic knee on the market. The Genium builds on Otto Bock's learnings from more than 14 years as the leader in microprocessor knees, starting with the launch of the C-Leg® in Germany in 1997. However, this is not a new C-Leg®. The internal workings of the Genium utilize a different approach, making Genium a completely new advanced technology platform for prosthetic knees. The American Board for Certification in Orthotics, Prosthetics & Pedorthics (ABC) recently awarded Prosthetics in Motion, Inc as an ABC Accredited Facility. ABC sets high standards for organizations so when a facility is accredited by ABC, it is considered the mark of exceptional quality. The Centers for Medicare and Medicaid service has validated ABC’s accreditation program and has established ABC’s accreditation as an approved prerequisite for suppliers of prosthetics, orthotics and pedorthics. This is another example that Prosthetics In Motion, Inc Manhattan, is committed to the highest quality prosthetic care for our patients! 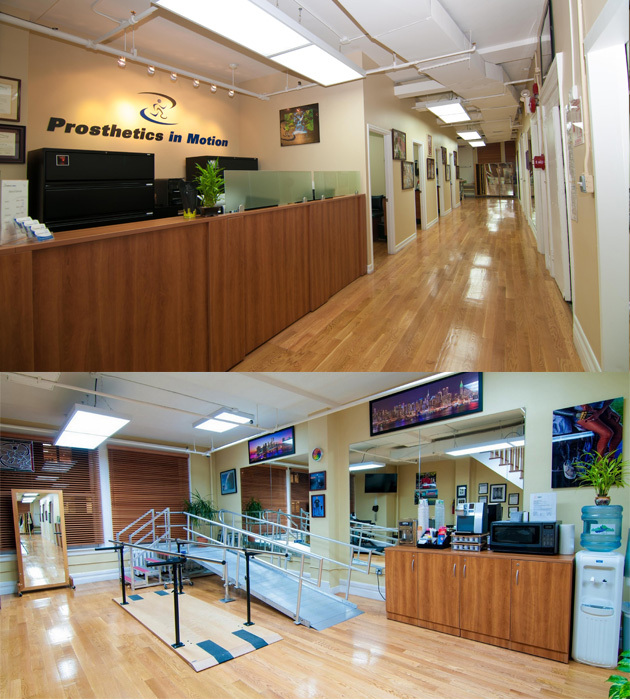 Prosthetics in Motion, is conveniently located in New York City - Mid-Town Manhattan. Minutes from the Mid-Town Tunnel, Penn Station and steps away from the Empire State Building. We have been called the best prosthetics company in New York City by our amazing prosthetic patients and we must agree! "The Big Idea". Check it out! As an amputee it's the little things that really matter. Prosthetics in Motion has been contracted with the Department of Veterans Affairs (VA) to provide prosthetic services. We are proud to help the men and women who have served our country! Prosthetics in Motion is happy to announce we are now contracted with TRICARE.